such a big pcb and only four switches...I'd take two sets ! however I don't understand the difference between Bypass and Off switch. On your version, will there be no OUTPUT LEVEL led indicator, right ? And I don't understand if it will possible to have it with 4 preset-switches plus RATE and DEPTH potentiometers ; via a fifth switch ? Switches are just carrefully selected settings of RATE and DEPTH from the internal lfo ? no control over mixing/inverting/filtering or else ? Off is a soft bypass, with the signal still running thru the direct path electronics, just the BBD path turned off. Not decided yet. It's hard to understand why you would need it, with compander and all. If you're using the BBD board as a standalone chorus, you have LFO1. There you can either have potentiometers and CV input jacks to control LFO1, or you can switch between a set of trimpots (off board) for presets. For a Dim D (Main board and BBD board), the BBDs are controlled by LFO2 (presets, main board) LFO signals are routed betweeen boards just liketh eausio signal is.. You just leave the controls for LFO1 open to disable it on the BBD board. But there is more: You can use *both* LFOs at the same time. Like, adding a tiny bit of fast modulation from LFO1 to the Dim D preset modulation from LFO2, for some extra "shimmer". Amazing. This will be a real bad project ! 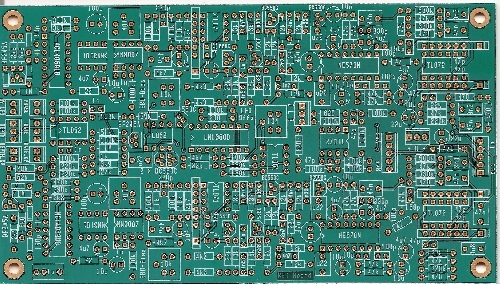 BBD Board prototype PCB is on its way to me from Olimex. Also, received HA1457 opamps from smallbear some days ago. I'll test that BBD board in standalone mode, and then proceed with designing the Dim D main board. This was in the mail today! This is a great record, and Popol Vuh were one of the most outstanding bands of the 1970's, I think. "Das Hohelied Salomos" is my favourite of theirs. My favorite is "Seligpreisung", followed by the Nosferatu and Cobra Verde soundtracks. Tested the BBD board (which is one half of the Dim D project) - works great. Tested with TL071 / 072 opamps so far. Will test with HA1457 soon. ... and it works with HA1457W's too, so I guess I got the footprints right. Which means, you'll be able to either build that effect using vintage NOS SIL package HA1457W chips, or TL071 / TL072 chips. When you're using sockets, you can try what you like best. The 47pF compensation caps for the HA1457W's are on the PCB, too. Moving on to design the Main Board now. great news, i can't wait! i'm very glad you are doing this jürgen! i´m really excited about this project... it´s gonna be huge!!! This sounds great, and I'm down for whatever, but I'm a bit confused as to what the Main board does. Is it just a special type of LFO?? Also, is it possible to do a Juno 60/106 emulation with these boards, and has anyone figured out what would be required to do that?? Having specific "I" and "II" presets might be a desirable feature, but I would be happy if I could get the same sound with knob settings. And the filtering, the cross-feeding, preset selection, power supply, balanced in/out. One should be able to get close to this, however, how close, I cannot say yet. Presets will be easy, that's for sure, as the LFO has VC depth and VC rate, sou you just need a set of trimpots and some switches to choose between them. So if we wanted to use the HA1457W it would take the place of all the TL072s & TL071s on the board? Looking at your component layout (http://www.jhaible.heim.at/subtle_chorus/jh_subtle_chorus_BBD_Board_PCB_values.pdf) that would be 6, right (1 for each of the 71s and 2 for each of the 72s)? Is this the right part - http://www.smallbearelec.com/Categories.bok?sfs=f9a155b9 - says it's an 8-pin chip and from what I've read this is a 7-pin chip, so just want to make sure. I figure these are ok and maybe it's mislabeled on his site, because you mention ordering yours from small bear as well. It's a 7-pin IC which fits into a SIL-8 (8-pin) footprint where one pin is missing. I'm afraid these are entirely different things. Ah, ok. I did notice that on the footprint of your component layout but was thrown off by the description, but that makes sense now. Thanks. Power supply is on-board as well. Will go on to implement the remaining 5%, and then do extensive checking for errors. Then, prototype. How much HA1457 does i need for one Dim D ? where can i get a good one ? btw. : a Friend and i patched today a Bassguitar thru my two Tau phasers and we got very nice and subtile chorus effects. so i'm really Ear when it's the speaking about "subtile Chorus". I was wondering how many HA1457Ws for the main board myself. Any other special/hard to find parts to note for the main board? But remember: you don't actually _need_ them. I'm pretty convinced that you can get the same magical chorus effect using modern opamps - the opamps are not where the magic is. I've sent the Gerber data to Olimex for making a prototype PCB. Let's hope this comes back ok - then maybe I can keep my promise to make the whole Subtle Chorus project available in 2008.